NASA Observatory Reveals a Dark Zone --"Swarm of 10,000 Black Holes Have Migrated to Heart of the Milky Way"
...And, most recently, NASA has announced its plans to send a mission to Bennu: a 500m long, rotating cluster of dust and rock which swings into sight of Earth every six years. The American Osirisrex spacecraft has arrived at Bennu, which looks just like similarly small (1 km, about twice as big) Ryugu, where a Japanese spacecraft currently is. 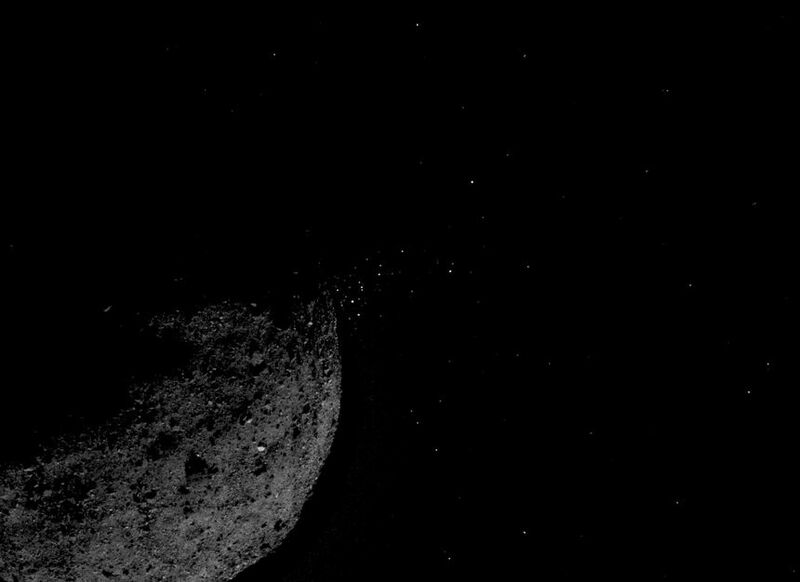 This little animated gif (from NASA) consists of telescopic photos taken about one-a-day since the middle of October, as Osirisrex approached little Bennu. (A microworld!) The last photo is from about 200 miles away. I'm speculating that if these little objects with microscopic gravity are rotating, centrifugal 'force' gives them equatorial ridges. So maybe this oblate-spheroid shape is characteristic of very small rotating bodies. Yeah, has that similar "pillow" look of 162173 Ryugu as the probe approaches. While everyone is paying attention to New Horizons' arrival at Kuiper Belt object Ultima Thule, Osiris Rex will be completing a very delicate thruster burn lasting a few seconds that put it into a gravitational orbit of tiny Bennu (only 500 meters across). It's going to be the smallest object that a spacecraft has ever orbited. While orbital velocity on Earth is about 18,000 mph, Osiris Rex will be orbiting Bennu at the blistering pace of 0.13 mph (6 cm/sec), relative to Bennu. New Horizons will be passing Ultima Thule at 32,212 mph, relative to Ultima Thule. It's interesting that Ultima Thule is far enough away, about 6 light-hours, that relativistic effects become relevant. Timing for the spacecraft commands is 'SCET' time, 'Spacecraft Event Time', time relative to the New Horizons vehicle itself according to the vehicle's own on-board clock. Edit: Osiris Rex has completed its thruster firing and has gone into in orbit around Bennu. Jonathan McDowell reports that the dimensions of Osiris Rex's orbit is a whopping 1.5 by 2.0 kilometers! So not only is this the smallest object ever orbited, it's the closest that an orbiter has ever been to object it's orbiting. It's kind of amazing that an object only 500 meters in diameter can still have a useful gravitational field that permits an object to orbit it. So this New Years Eve is a big night for NASA. Two records. Both the smallest object ever to receive an orbiting satellite, and the farthest object ever to receive a reconnaissance fly-by. Bennu is spitting material into space! That caught the Osiris Rex team by surprise. Maybe the distinction between asteroids and comets isn't as clear as once assumed. Apparently there's some kind of volatile material on Bennu that's being heated by the sun and turning into vapor, mini-explosively, enough to propel small rocks off. 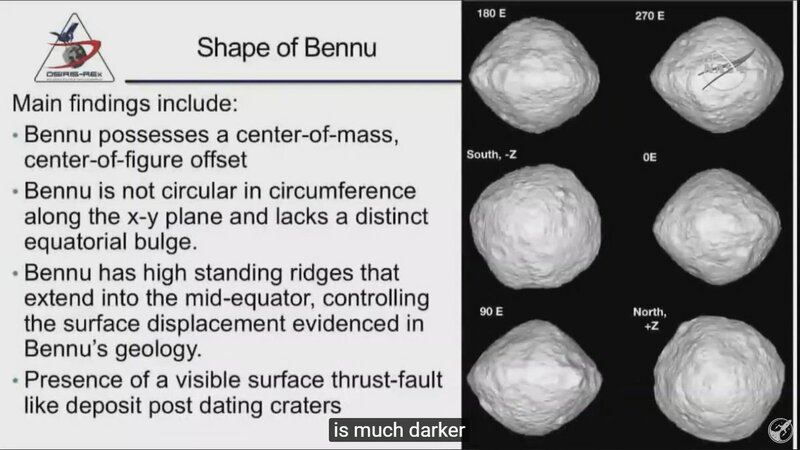 (Bennu's so small that it has almost no gravity.) It's a pretty weak comet tail, but there it is.